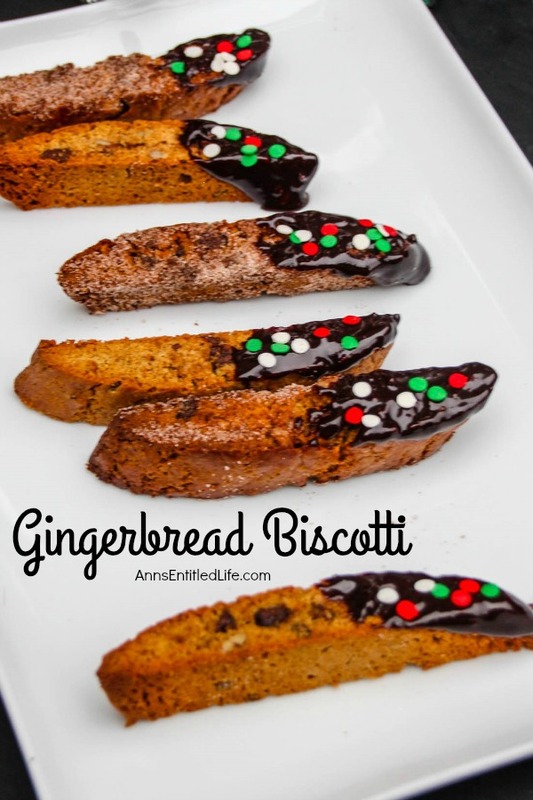 A delicious biscotti recipe perfect for holiday breakfast, desert or snacks. Enjoy this spicy, crunchy, Gingerbread Biscotti Recipe with coffee, tea or hot cocoa on a cold winter day. • Line one large or two small baking sheets with parchment paper or a silicon baking mat. • In a large bowl, stir together dry ingredients flour, baking powder, cinnamon, ginger, cloves, pepper and salt; set aside. • In a medium bowl, whisk together brown sugar, granulated sugar, molasses, butter, whole eggs and vanilla. • Add wet ingredients to the dry mixture and stir to combine. • Divide your sticky dough in half. • Using floured hands, transfer first half to the prepared baking sheet(s) and form the dough into a slightly flatted log about 11″ long by 2 1/2″ wide, going down one side of a baking sheet intended for two logs, or the center of a baking sheet intended for one log. Repeat with second half of dough. • Whisk egg white in a small bowl until a little foamy and loose. Brush over top and sides of each log. • Bake logs until golden brown all over, about 25 minutes. • Place tray on cooling rack; let cool about 25 minutes or until lukewarm. • Gently transfer each whole gingerbread biscotti log to a cutting board. Using a sharp serrated knife and gently sawing motion, cut logs on the diagonal into 1/2-inch wide slices. • Arrange slices, a cut side down, on baking sheet(s). Bake for another 6-7 minutes, until golden underneath. Turn each biscotti over and bake for a final 6-7 minutes, until lightly bronzed all over. • Let cool on rack. • Melt chocolate on stove or in a microwave. • Dip one end of the Gingerbread Biscotti into the chocolate; add sprinkles or nuts. • Keep in an airtight container at room temperature. 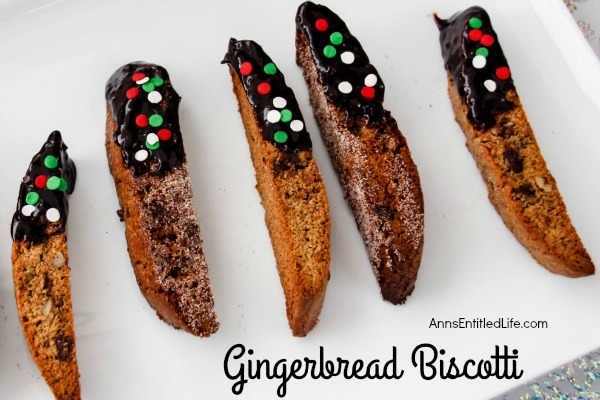 • To print the Gingerbread Biscotti recipe click here. Note: Biscotti generally tastes better a day or two after you make it! If you decide to add nuts or chocolate chips to the dough, mix it in when you mix the wet and dry together.